I had a writing conference with one of my third graders recently. I didn't realize at the time just how similar she and I are as writers. She was showing me her notebook and what she was working on, and I started to notice that she wasn't really doing much writing. She had plenty of ideas to write about, and even some really intriguing plans and notes and lists in process. "So do you think you're ready to get started writing?" I asked her, and before I even finished the question, as if she knew what I wanted to nudge her towards, she started hemming and hawing about the idea for her story. She said something like, "Well, I'm not sure what should happen after the girl arrives on the new planet." "Oh, okay. Well how about if you..."
"It's just that, it's an important part. I thought I'd have her look around for awhile, but that seemed boring, so then I thought she could maybe find something important. But I need to figure out what she should find. I mean, the whole point of the story is that she saves her own planet, so the thing she finds could help her do that." "Hmm," I said. (Genius of me, right? Really powerful stuff. Give her the old, "Hmmm." That will really teach her something.) Clearly, she had a lot of great writer-like thinking going on, and I didn't want to extinguish it. Not sure of what else to say, I encouraged her with, "Keep thinking. You'll figure it out," and I moved on to another student. But I couldn't focus on the next student. My mind stayed on the other girl, the one wrapped up in thinking about her story. I thought about how much I could relate to her, that sense of tinkering around with an idea in your mind, solving one idea, only to come up with four other scenarios that need to be mentally worked through. After a hefty chunk of writing time, she had absolutely nothing to show for her time. Sure, she'd been doing some heavy-duty thinking and pondering, even some jotting, but how healthy was this as a writer? I thought back to my own blog-writing. I pictured the list of at least eight blog posts that I'd started with some kind of idea and a few sparse notes. I thought I was just keeping each of them parked so I could wrap my mind around one, think it through before actually writing the post. And it started out that way, back in November. But here it is January, and the list of ideas continues to grow, but they also are each continuing to grow colder. My sparse notes became less about a plan and more just a means not to forget the ideas' inspirations. 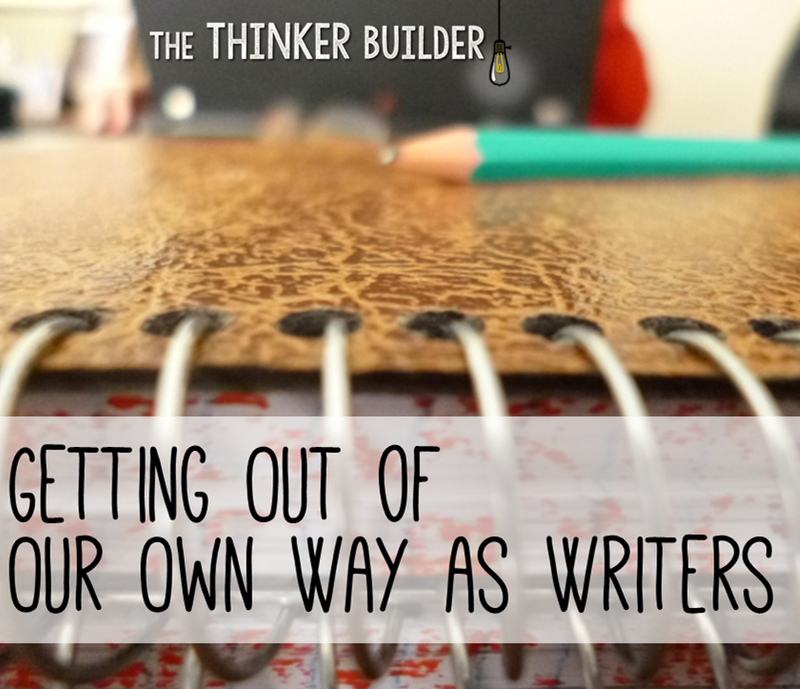 Writers need to think. But they also need to write. And this student of mine was helping me realize that it's a slippery slope from tinkering with ideas to simply gathering ideas, never doing anything with them. Well I marched back over to my girl, and took another approach. "I want you to try something, dear. Just start writing. I know you haven't figured it all out yet. I love how you are thinking so carefully about your story. But look at your notebook. Your story is not in it. I want you to take a step forward and just start writing it. "When you come to a part that you haven't figured out yet, I want you to just pick a path and keep writing. We can come back to that spot later and change it if you want. "And if you come to a part where you just don't know what should happen, I want you to just leave a few blank lines and skip that part. Move on to what happens next. We can come back to that spot later and fill it in." And then I sat by her and watched her start writing. Every few seconds, she looked up at me, struggling, and I said, "Go ahead and write it one way. It might not be the way you end up liking, but it's something. Keep writing." She wrote more than a whole page in that little session. (There wasn't a whole lot of time left because she had spent most of the time getting in her own way.) But I don't think I've ever seen her write that much in one day. Afterward, I told her, "Tomorrow, I want you to read what you wrote today. You might love it. And you might hate it. But even if you hate it, you have it. You can tweak it, change it, add to it, whatever. But that's what writers do. They write something. And then they make it better." This post was my something. I'm sure it could be better. But it was time to get out of my own way. So, what happens when it's time to do the tweaking, the changing, the adding? Check out my series on the phase of the writing process that often draws the short straw: revising.